Cottontail Cottage Animal Sanctuary hasn't added a story. Cottontail Cottage Rabbit Sanctuary (ccrabbitrescue.org) is in need of sustainability funds. The annual cost just to feed, shelter and provide medical care, including spay/neuter is tremendous, and puts a lot of fear in our hearts. At capacity with 60 bunnies currently living at the sanctuary, (many of whom are available for adoption) and hundreds more a year we work effortlessly to aid and assist, the weight on our shoulders is great. But we will not fail these animals who gaze at us with eyes filled with faith and trust; nor the long list of names of buns - many of whom are in desperate need - to come here. Our will-power and strength of mind and heart are not diminished. And, our vision of a bigger and brighter future for these animals shines more brightly every day. WHY ARE WE RAISING $21,840? But hold on! That is only for food. When you figure in the cost of bedding materials, animal care/supplies, medical costs, veterinary care, medications, spay/neuter fees, utilities, shelter maintenance, fundraising/administration expenses - well, now you have a "whole nother" equation. The expense to operate an animal shelter is extremely expensive. We are not funded by any state, government or local agencies. What we do comes from you, our incredible donors. Did you know, that Cottontail Cottage is the only licensed, vegan-run farm sanctuary in New England? Did you know that we get calls from folks all over the world looking for advice and help with their rabbits? We are accessible day and night, to help people in emergencies and with their bunny's daily care. Our reach is wide and it is profound. And thanks to you, together, we can save somebunny today. None of this could be done without you. You play the biggest role here. Even more than the we do; regardless of the constant march from barn to barn; the heartache and worry; and moments of great joy when we witness the first binky (happy dance) from a newly admitted bunny who had previously languished for days and days and months and months, in terrible conditions, just waiting for his chance to come here. To witness that first desperate dash of freedom and awakening of eyes when they realize that they can move; that they can eat and hop, dance and be loved is all the reward we need. In the book, the Velveteen Rabbit, it says: “Real isn't how you are made, it’s a thing that happens to you. When a child loves you for a long, long time, not just to play with, but REALLY loves you, then you become Real.” And that is what happens all the time around here. That is the real magic of this place. This is what takes us out in the cold, rain, blizzards, sweltering, hot days, birthdays, Christmas - it doesn't matter what day it is - what matters is the bunnies. These sweet, innocent, gentle lives. And thanks to you and your support, we are able to be here for them. We can't stress this enough. We need you to know how important your support is. We need you to fully understand that you are as much a part of our mission as any of us are. You are so greatly appreciated. You are so greatly reverred. You are our heroes. Because, without you, none of the hundreds and hundreds of bunnies we've saved over the nearly, ten years we've been here, would be where they are today. Safe. Loved. And well cared for. YOU DID THAT! We are looking for donations we can put into a sustainability fund. Without such a fund, we are at risk of closing. Our bunnies are at an even greater risk. That long line of buns will never get here. There are so few of us that can do what we do. We never want to fail these animals. No matter what. But we can't do that without sustainability. And that funding and support needs to come from you. As important as our donors are, we are also looking for a select few who can commit to larger sums that we can draw upon. That we can count on to secure our future and presence in a world that often overlooks these precious lives. Currently, there is no more room to grow or expand on our current homestead. As much as we love the cottage, we know in our hearts that this isn't the whole dream. That this isn't all we imagined when we first started out. There is so much more we can do! So much further our reach! And so many more lives that can be saved - either physically here, or by giving guidance to keep them in their current homes. But we can't do that here. We have maxed out every space we have. And so, we feel that the time has come to trudge up that the next big hill and start on the next stage of our journey. That means moving. At the moment, we are looking for a bigger place. Our vision includes a farm with fields to "relocate" our current barns and space to purchase a two-story 32x24 barn to house buns who require critical care. Most of these rabbits would come from animal welfare. This is very important to us. Mostly, because it makes sense. By aiding animal welfare, we are helping to stop the abuse of animals and end a vicious cycle of corruption from some of the very worst offenders. But also, because there are very few places that will take in large numbers of rabbits at a time - most shelters do not take in rabbits to begin with - from hoarding cases or severe cases of neglect and abuse, where the majority of them are sick and in need of immediate medical attention. They simply will not do it. They do not have the resources. Where then, will these rabbits go once they've been rescued? The new property would give these bunnies sanctuary and a place to rest and heal; and hopefully in time, the chance to find a forever home of their own. A new property, would also give us room for parking during our popular open houses (which has become a real problem at our current location.) This in turn, would lead to more educational events. Public outreach and education is incredibly important to us. We can't save them all. We know that. But we can work to change the way rabbits are viewed; the way they are cared for; they way they are treated. An education center would give us a place for seminars such as "foraging to feed your rabbit"; hands-on demonstrations on rabbit care; and opportunities for vegan outreach such as sampling vegan-fare with tours of the facilities in an attempt to encourage and demonstrate compassion for all animals. Donate. Every dollar counts. I promise you. You will not be looked down on for giving $2, $5 or $10 dollars. Here's the thing: it all adds up! And when you make a pledge, you make our hearts sing, for that quantifies more lives we can save. And you become a part of this adventure! A part of this mission and a part of something so special and inspiring and simply put, awesome. Please donate. Please help us continue to help these poor animals. They need us. But more importantly, THEY NEED YOU! Cottontail Cottage is a 501(c)3, non-profit. YOUR DONATION IS TAX-DEDUCTIBLE. Thank you for all you do for the bunnies and the amazing support you show us. You have always been there for us. You have never failed or faltered in your desire to help. And when times get tough, you are right there with outstretched hand to hoist us back up. We hope you know how much this means. How much we appreciate you. We thank you for your advocacy and compassion for animals. Cottontail Cottage Animal Sanctuary hasn't posted any updates yet. Cottontail Cottage Animal Sanctuary is managing the funds for this campaign. 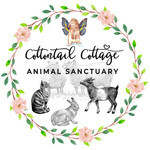 Cottontail Cottage Animal Sanctuary is a verified organization.